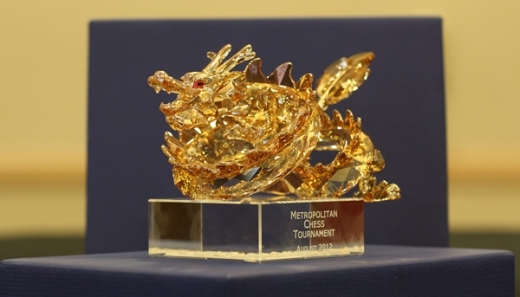 The 2nd Metropolitan International was held from August 14th to August 18th, 2012 in Los Angeles, California, USA. 58 players competed in the 9-round Swiss open which was valid for FIDE title norms. Top seeded were GM Timur Gareev (USA), GM Robert Hess (USA) and GM Varuzhan Akobian (USA). GM Timur Gareev, new-comer to the US chess federation, and IM Dionisio Aldama jointly won the tournament on Saturday, August 18th, 2012, in Los Angeles, finishing both with 7.0 out of 9. In the armageddon tie-break, IM Dionisio Aldama claimed the Swarovski Trophy. Kayden Troff scored 5.5 out of 9, becoming America’s newest IM-elect via the event. This was the second edition of the event – last year’s edition was won by none other than Super-GM Michael Adams of Britain, who made one of his first forays into chess on the west coast of the USA.